The end is almost here, and Jon Stewart is just three weeks away from stepping down from The Daily Show, a program he's helmed for 16 years. If you're looking for a little memento from your favorite late night show, Stewart is auctioning off his Daily Show suits on eBay to benefit Achilles International, a nonprofit dedicated to helping people with disabilities participate in athletics. Stewart, who has long had a relationship with Achilles International, previously ran in its Hope & Possibility 5-mile race and even recorded a shout-out to the organization from his studio. As Stewart gives his take on the news each episode, his sartorial choices have helped convey a sort of feigned seriousness that mimics the outfits of the soon-to-be bygone nightly anchor. His image is as consistent as his comedic delivery. We're all familiar with the pieces that go into Stewart's look: a dark tailored blazer, crisp collared shirt, and a colorful tie (often pinstriped, though not exclusively). Now, you can get a little Stewart on you, since some of his show suits are currently up for auction on eBay. You can choose from different suit styles, whether it's pinstripe, plaid, or tonal. All of them come in a size 40S, with most custom-made Armani Collezioni Made to Measure ensembles. They're currently running between $40 to $200. The auction officially goes through July 30. 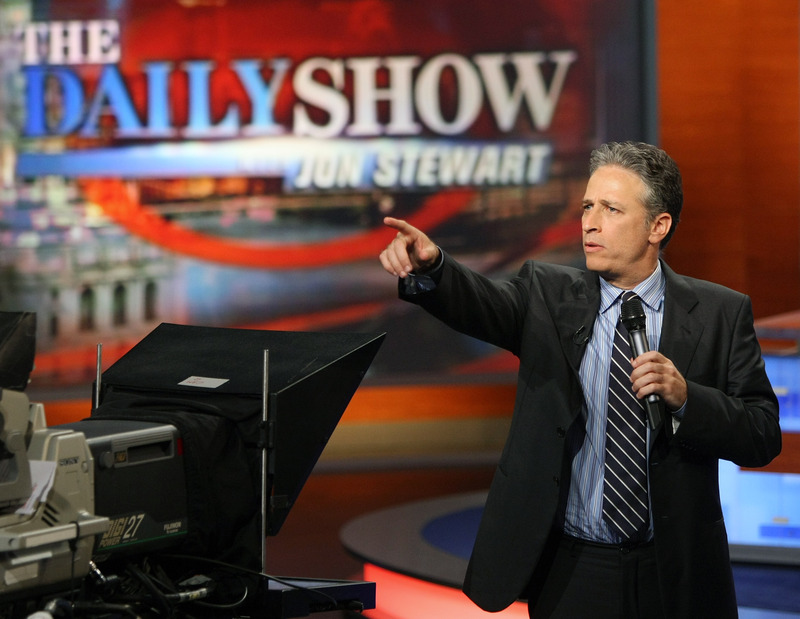 The charity auction is a touching way for Stewart to leave another lasting mark from his time on The Daily Show. Yes, Stewart has had countless legendary interviews, and his best moments and jabs will live on in the Internet. But there really is nothing quite like a man in a suit, and those suits won't be forgotten.